Unfortunately we won’t have time to visit all 16 schools this year, so we decided to visit two schools based on leadership and need (as well as finishing off our project with the kindergarten we helped last year in Muong Khong). 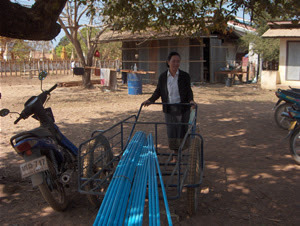 Phengphanh Philachak (head of kindergarten) with water pipes purchased by Jai Dee. The first school we visited was Khinak, on the mainland, which serves around 80 children. We were very impressed with the kindergarten principal and her teachers—when we arrived the children were focused on learning shapes, and each child was taking turns at the blackboard. The rooms were clean, orderly with a wash basin area. And she had used old tires to create a play area outside for the children. The only thing they really needed was a waterline from the elementary school next door, and since it was only $50 we decided to do it on the spot. We went to the local hardware store, bought the pipes etc, hired a contractor and left. We shall go back to check on it in a few days. The second school we visited was Ban Dua, on the little island of Don Baing. During the meeting with all the principals, the principal of Ban Dua’s kindergarten really stood out because of her enthusiasm and initiative. She said that her students attended regularly even though the school had big holes in the walls. They had no money so she made her own educational toys. Getting to Ban Dua turned out to be an adventure. We rented a motorbike and drove from Muong Khong to the end of the island. Then we parked our bikes in the ferry owner’s backyard and waited for him to come and start the ferry—a couple of dugout-style boats with planks of wood nailed across them. From the other side it was a 20-minute walk across dried up rice fields and through the small village of Ban Dua before we arrived at the kindergarten. The principal had not been exaggerating. The walls were mostly missing and the roof had holes all over it. During storms, the wind whipped through and water would lash the children. Not to mention the fact that you can’t put up posters or store school supplies in such a faulty building. We talked to the government official for the school (both the elementary & kindergarten schools) and were soon joined by a mix of other teachers and locals. We told them we wanted to help but it had to be a partnership. We would provide the materials, but the community would have to pitch in to help. Also, it would need to be done very fast, started within a week. This created a flurry of planning and measuring. Meanwhile, we were handed fresh coconuts with straws in them. It was many hours later when we took the long walk back to the ferry and headed to the market to order the supplies. Actually getting the supplies (and money changed to pay for the supplies) was another adventure, which included 2 full days of driving around on a rented motorbike from dawn till dusk. But all is on track and we’re excited! This Saturday (Jan 19) we will be up at 5am to go over and help the community put up the bricks, wood, etc. We’ll be buying lunch for all—which means we buy the food here and bring it there to be cooked. They’ll be contributing freshly-caught fish. It should be quite a good, dirty workout! Left to right: Come-mun Mannivanh (head of kindergarten), Thanou (Jai Dee), Somie Singh-sa-vah (head of education for Ban Dua).